Some would argue that we flock to videogames for the buzz of a good power trip (consider the laughably absurd dimensions of Marcus Fenix’s musculature in the Gears of War saga). However, flipping this convention on its head, Sony’s ultra-violent riff on Greek mythology, God of War III, goes out of its way to make you feel like a mosquito perched atop a dinosaur’s mountainous shoulder. 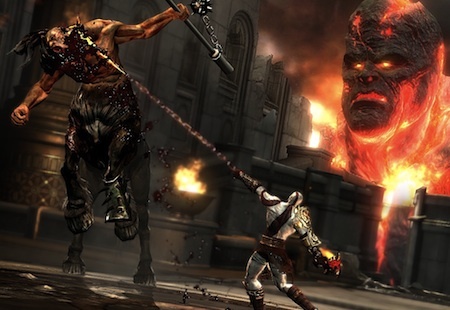 In the game’s most breathtaking sequence, Kratos’ quest to exact vengeance on the gods of Mount Olympus finds him scrambling up the crusty skin of Cronos—a skyscraper-tall Titan who’s been banished to the volcanic pits of Tartarus. Whenever the camera pulls back to appreciate the scale of what’s going on, you lose track of Kratos altogether until you notice the tiny streaks of his twin blades flailing about. God of War III delivers a chewy metaphor for how insignificant humans feel in relationship to the unknowable vastness of space and time. If we rage against the idea of a god, part of that impulse must stem from our discomfort with the notion of resting firmly under his thumb. Kratos himself is a mortal, but he’s not one to be pushed around. At the conclusion of his quest he even has a chance to kill his father/creator, but will that victory reverse the slide into dystopian chaos that his actions have wrought? While I doubt that Sony’s development team at Santa Monica studios aimed for such theological resonances, they beg for a closer reading nonetheless. The game’s white-knuckle combat and benchmark-setting visuals conclude the trilogy in sublime fashion. In fact, the game would be nearly flawless if not for the finale’s jarringly overcooked musings on Kratos mustering the strength to forgive himself, hope is the most powerful weapon in the world, blah, blah, blah. Following the final climactic showdown with Zeus, the game’s rambling, artsy denouement unfortunately ends the game with a stifled yawn rather than the roar you’d expect from a game that achieves such dizzying heights.